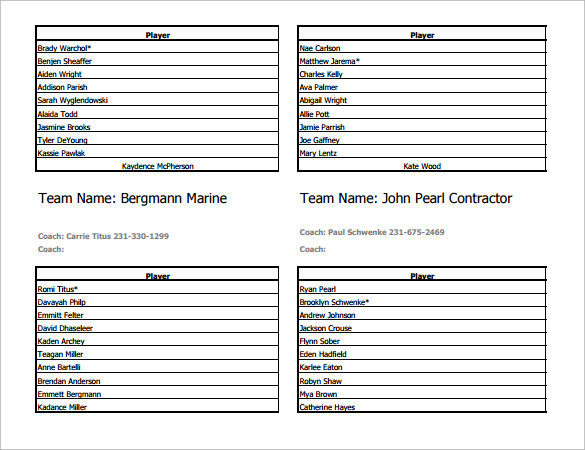 Our website has a wide range of samples for soccer team Roster Templates that are used before soccer matches to put up the lineups of teams. These Roster Templates are available in perfect grids and columns that give you the complete details that are to be filled and they are present in black and white as well as colour, with some of them using interesting designs to make it more attractive. You can select your favourite design and start working on it. You can download and print them in DOC format. Rosters are needed before every match, for providing the list of players along with few other details. 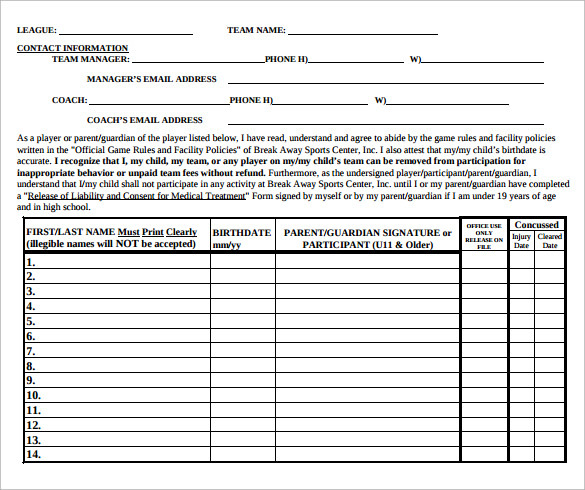 In this template, there are spaces for providing the name of the club, coach, manager’s name, names of the players along with their birth dates and jersey numbers. This template is very helpful in creating Rosters in the correct way. There are spaces for the match date, names of the two teams, the name of the field, and the name of players playing in the particular game. There are other details like OASA card, shirt number, etc. 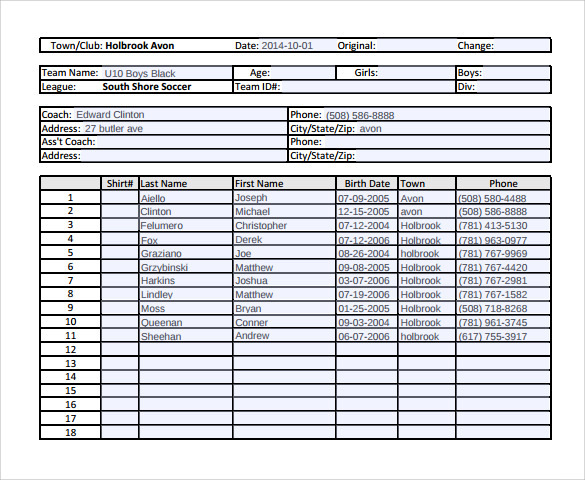 Such templates are helpful for providing the list containing names of the total number of players. In this template, there are columns for providing the names of the players in a team along with their shirt number and birth dates. In this template the details of the team lineups can be easily provided, in perfect grids as well as columns. The name of the team is at the top followed by blanks in which the members of the team are provided. 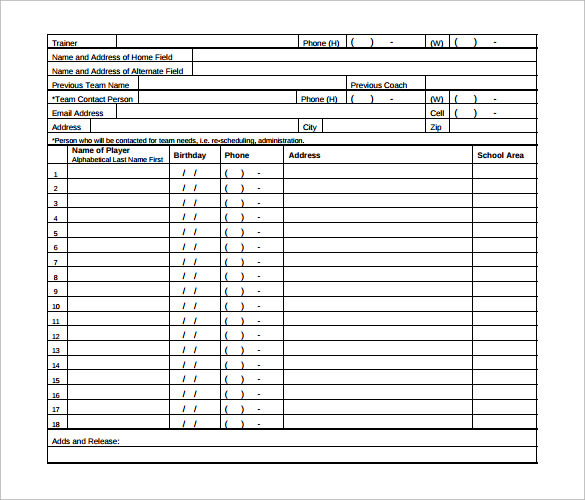 Why Do Teams Need Soccer Team Roster Templates? In football, the teams need to provide the full list of players to referees, for keeping a record of them. In the list, there are also the names of players who are playing in the particular match. Teams need to properly make the list so that there are no confusions later, and also, the layout looks impressive. 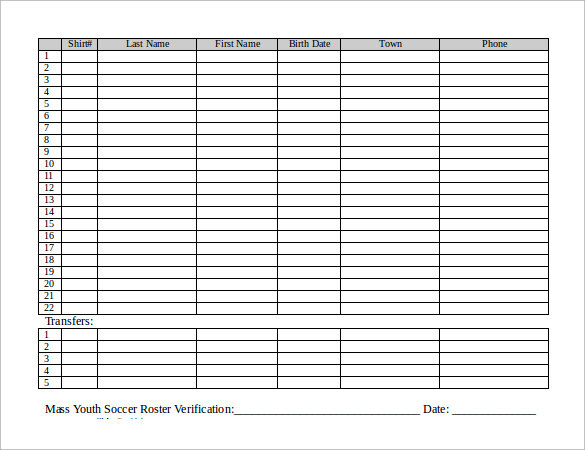 For this purpose, teams need the soccer team roster templates, for getting the right methods and know the correct ways of making the list. It also provides options of adding additional information like, the name of players who have been transferred from the team or transferred to the team, their date of births, jersey numbers, the name of the team manager, the venue of the game, the name of both teams etc. You may like Football Roster Templates. When Do Teams Need These Templates? 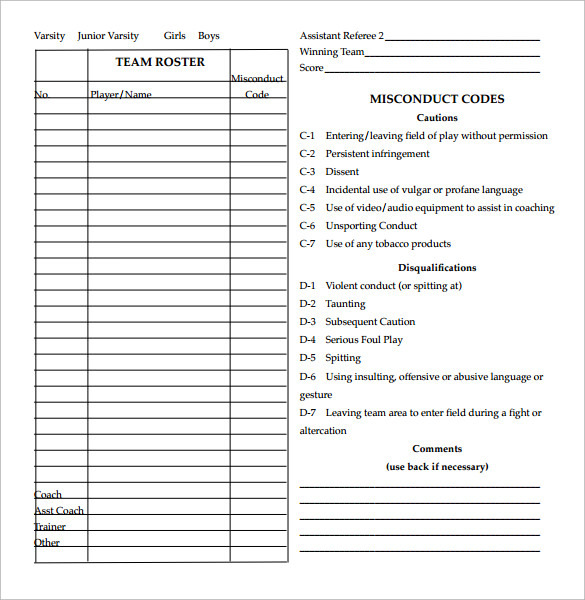 Before soccer match, every team needs to prepare a list containing players’ names and submit it to match referees, for keeping a record of them. Every team must make the list accurately and devoid of any mistake so that there are no confusions later. The layout must also be correct and impressive. During such situations, teams need a proper guidance and help and these templates can be very helpful. They provide the teams with right ideas and show them the correct ways of making these lists. You can also see Hockey Roster Templates. 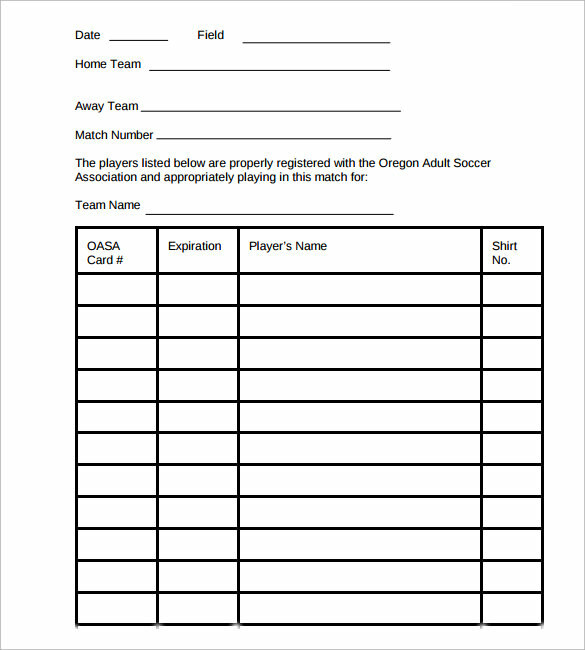 These templates are of immense importance as these provide the proper layout for creating a list that is needed in a soccer match. It becomes very tiring and consuming to create a list of the players along with other details every time. Thus, you can simply use this template whenever you need. 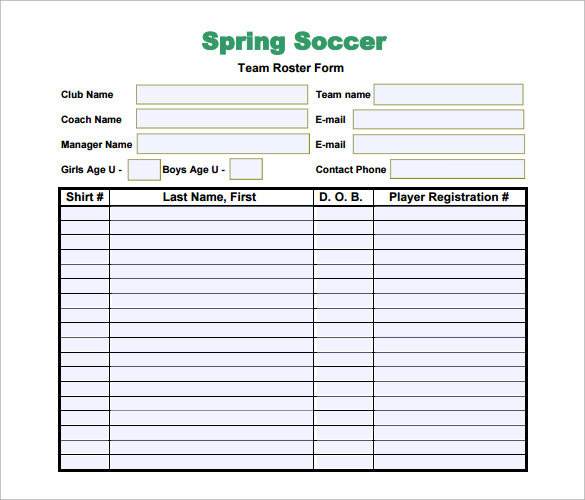 Every soccer team needs roster for providing the list of players who are in the team or will be playing in a particular game. 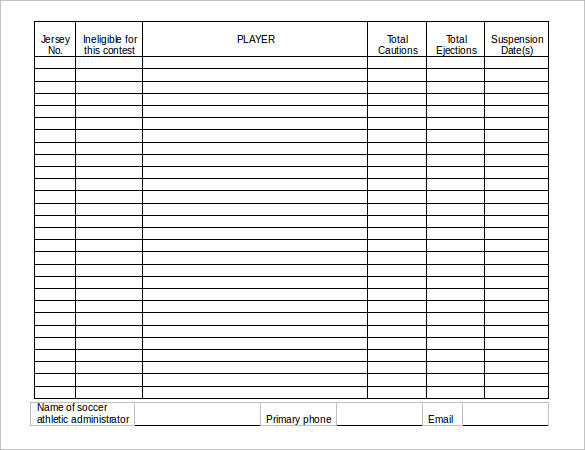 So, for that purpose, teams can take the help of these templates for making proper and accurate soccer rosters which will be useful to referees as well.